If you have installed Microsoft Windows Server 2016 and are wondering where the GUI now called Desktop Experience is, then unfortunatly the only way to have the Desktop is to re-install the OS. 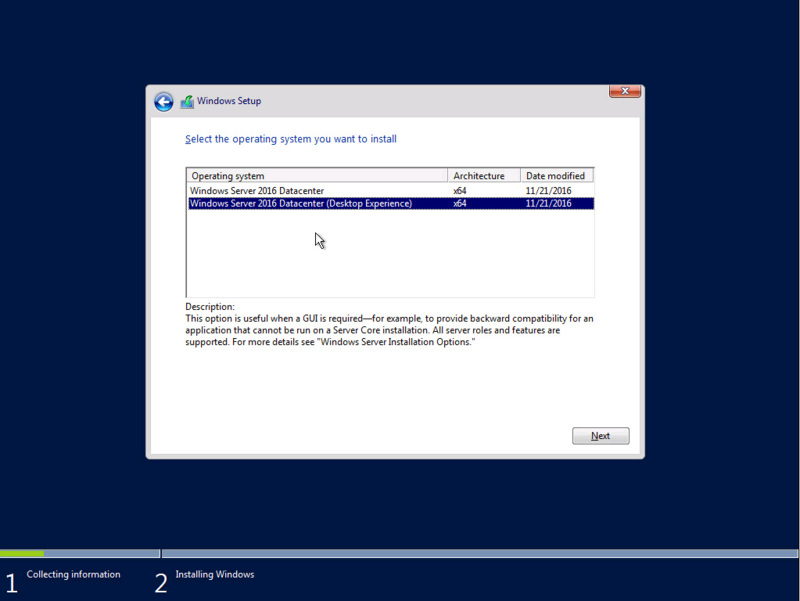 I have just installed Windows Server 2016 today for the first time, and as its just for testing purposes, never really paid much attention to the installation procedure. I’ve installed Windows countless times, so just always click next, next select disk finish. Unfortunatly this time, Windows Server Core (thats what it was called in the old days) appeared. No big deal, lets have a quick google and install it. The first article you come to is from petri.com (everyones favourite source of Windows fixes) and it gives you some tips on how to install the GUI using PowerShell. Perfect! Unfortunatly no! It doesnt work. This article was written when W2k16 was in Tech Preview. The install feature isnt supported in the GA version. Unlike some previous releases of Windows Server, you cannot convert between Server Core and Server with Desktop Experience after installation. If you install Server with Desktop Experience and later decide to use Server Core, you should do a fresh installation. Its a bit annoying. Surely Microsoft must realise people may want to change server roles without re-installing Windows everytime. Anyway, hopefully this will help others and save countless google searches. Desktop Experience is a feature that appeared in Windows 2008 R2, 2012 and 2012 R2 and preview editions of Windows 2016. But now in the full release of window server 2016 it is now built in, so you do get Windows Media Player, Disk Cleanpup, Snipping Tool, Character Map, Sync Center, and Windows Store (if enabled). See ‘Windows Accessories’ in the start menu.